Toy Soldier Of The Week – Danov Valravn! It is with great personal pride, and great honour, that I can announce that this weeks Toy Soldier Of The Week is the wearer of the greatest boots, collector of many a gasmask, and highest flier of them all, Commander JET! 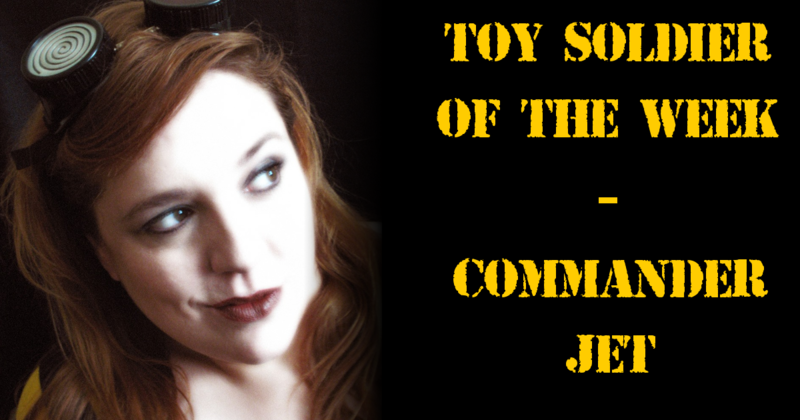 Commander JET has recently stepped down from her position as Administrator, due to her commitments elsewhere, but as she remains a Toy Soldier, the “Admins don’t get TSOTW” Rule no longer applies. As such, I think I speak for everyone in the Army of Toy Soldiers, when I say, THANK YOU. Thank you for years of guidance, leadership, missions, propaganda, invasions and fun. Without your continued efforts, we would not be standing where we are now. In fact, it may be that the Digital Bunker might have closed its doors forever, without you. On a personal note, she has not only been my Commander, but my mentor and friend, and I hope to continue on as the administrator she inspired me to be. We, the Army of Toy Soldiers, SALUTE YOU! Next Next post: Houston, we had a problem! – Mad Monkey Maintenance inc.
A bit late, but congrats from me, too. You deserve all of the gratitude with all the energy, love and time you invested in TSU. Always remember you and your work is very much appreciated, as admin and as a person. A well deserved award, to a well deserved individual! Congrats Commander! It’s about time we threw some recognition your way! Some WELL earned recognition. Well deserved indeed! May I forever serve under your guidance! Congrats, Jet! Well deserved and long overdue!